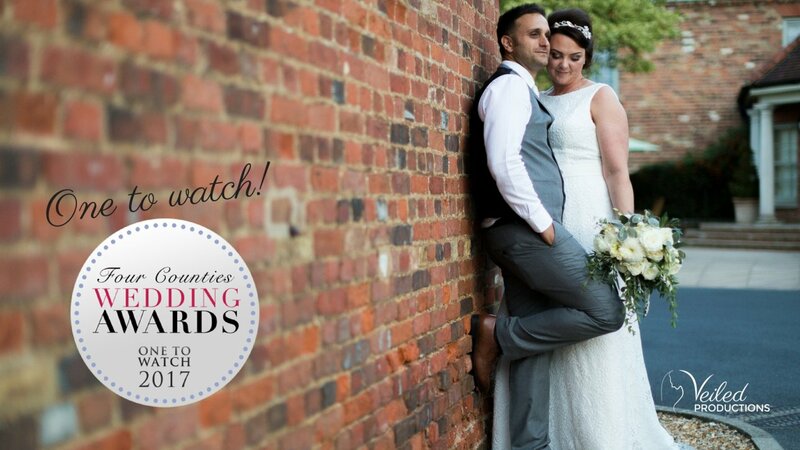 The Four Counties Wedding Awards – #4CWA – celebrate dedicated wedding suppliers across Bedfordshire, Buckinghamshire, Cambridgeshire and Hertfordshire. Last year’s winners included some amazing suppliers we know and love – Lina and Tom Photography, Signature Flowers and La Belle Cake Company – so to be shortlisted amongst them this year was fantastic. The winners in 2016 put together a fabulous styled shoot earlier this year which was Cuban themed. That set the style for the awards ceremony, and people really made the effort! We went for glitz and glam but there were all sorts of outfits including floral shirts, flower crowns and lots colour! A section of the evening was dedicated to 4CWA’s support of the Wedding Wishing Well Foundation. As well as a holding raffle that raised hundreds of pounds for the cause, we watched an extremely moving video describing the work they do for terminally ill couples who wish to declare their love for each other in front of their family and friends whilst they still can. It’s hard to put the wonderful work they do into words, so we will let the video speak for itself! It really is a wonderful cause and we have volunteered our services to The Wedding Wishing Well Foundation should anyone in our area ever be in need of them. The videography category was one of the last to be announced so anticipation was brewing all night! We are proud to say we are the “One to watch” for videography! Awards ceremonies are always a great place to catch up with people – an unexpected surprise was to be greeted by our wedding insurance provider! We’ve only ever spoke on the phone, so it was great to finally meet. Cheers, Adam! What did couples say about Veiled Productions in the awards? Although people voted anonymously in the awards, the organisers were able to share these comments with us from couples. We are so proud to read them as we are with all our reviews – thank you so much if you left comments in the awards voting. They provide such a personal and thoughtful service. Rachel felt like such a part of the wedding- going above and beyond to give us a perfect wedding film. She even helped sort my dress when I had problems!! Very friendly, down to earth, captured our wedding day perfectly! Have already recommended Rachel to my sister and a few friends for their special days. Veiled Productions conducted our ceremony for free through a cancer charity called ‘gift of a wedding’. Even though their service was for free they were professional and gave all their time to capture every special moment. The end product is a treasured memory for us. Veiled Productions went above and beyond with their services. From the minute I contacted Rachel she was friendly & approachable and her communication was outstanding which certainly helped with the stress levels involved in planning a wedding. I had some restrictions due to the venue but Rachel went out of her way to help manage these and offered reassurance and support to ensure she captured our day. Even coming to meet our vicar. On the day Rachel was again calm, professional and friendly. Previous Post Looking to get married outside? Chippenham Park Gardens is stunning for an outdoor ceremony. Next Post Destination wedding – yes or no? Claire Clarke Weddings shares advice about getting married abroad.